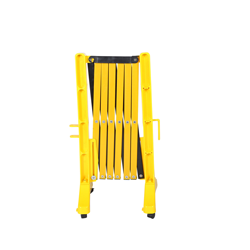 Expands to over 11’ length, contracts when not needed to just 16.5” long. 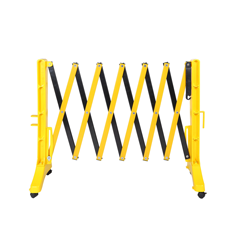 Ideal for use as barrier for warehouse, industrial use or retail aisle, or for outdoor use. Lockable wheels included. Maintenance-free, temperature-resistant, and wont mark floors. Features male and female hooks on either end for linking to another gate. Yellow/black. Simple, quick tool-free assembly.